Bike Pic Nov 5, our ice cream smiles Sunday picture of the day! Its Ice Cream Smiles Sunday around the world. 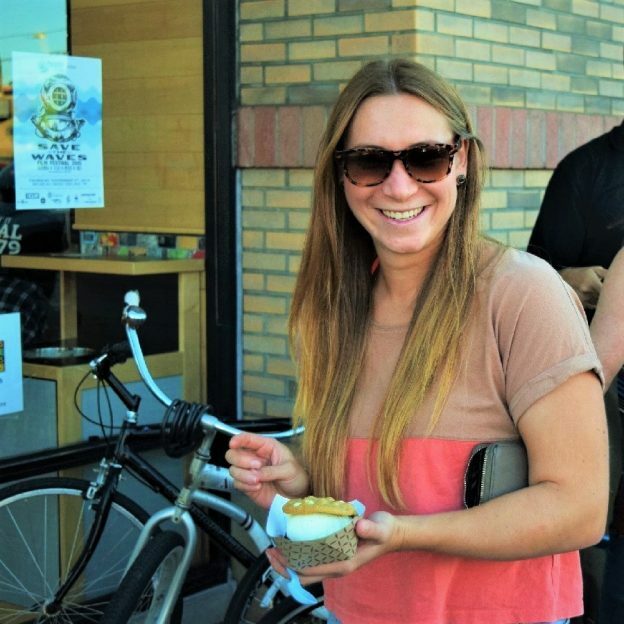 Here in San Diego this young lady stopped, with her friends, along the bike route to enjoy a creamy cool ice cream sandwich before resuming their bicycle ride. 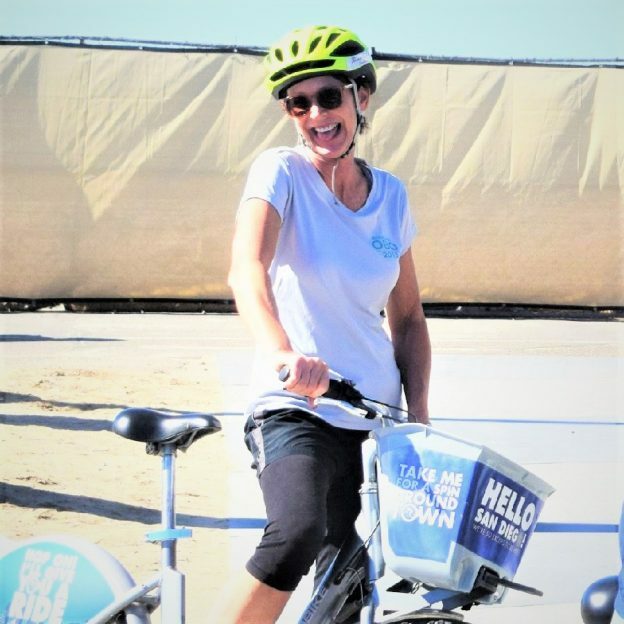 This entry was posted in News and tagged beach bike trails, Bike San Diego, cool treats, fun bike picture, ice cream, Ice Cream Cone, Ice cream smiles, Ice cream Sunday, Icecream of Instagram, icycle adventure, San Diego CA, Sunday on November 5, 2017 by Russ Lowthian. 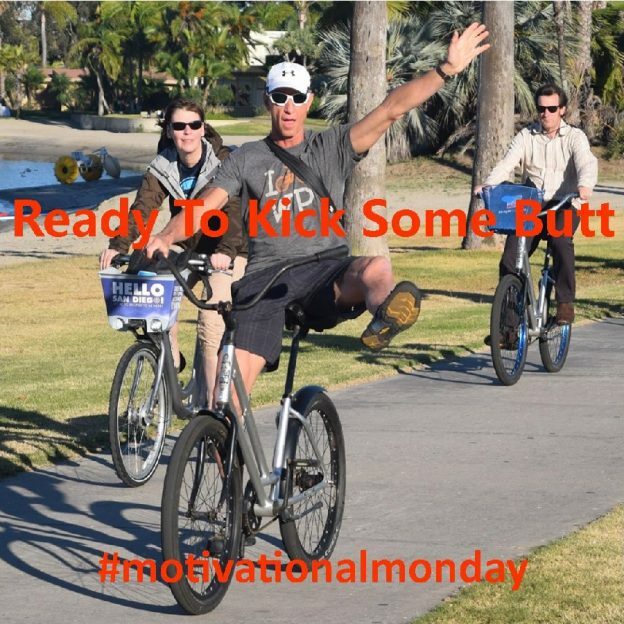 This Motivation Monday cyclist demonstrates his enthusiasm as he attend the Bike Tourism Conference, held in San Diego, CA last year. The 2016 National Bicycle Tourism Conference will be held November 2-5 at the Sirata Beach Resort in St. Pete Beach, Fl. Each year tourism bureau’s, bike tour/event directors, and other bike related companies meet to network and learn the latest to bring you your #nextbikeadventure. See our Photo Gallery from the 2015 Conference in San Diego. With the leaves turning in the last week of October here in the upper Midwest, its perfect biking weather and we hope you get out on your bike. Get out and enjoy all the fall riding possibilities in Minnesota because and see all the bike friendly places to explore in the new Minnesota Bike/Hike Guide. Thanks for viewing the Fun Motivation Monday Pic of the Day. Now rolling into our 10th year as a bike tourism media, our goal is to continue to encourage more people to bike and have fun. While showcasing all the unforgettable places for you to ride. As we continue to showcase more place to have fun we hope the photos we shoot are worth a grin. Also, as you scroll through the information and stories we have posted, enjoy. Do you have a fun bicycle related photo of yourself or someone you may know that we should post? If so, please send your picture(s) to: editor@HaveFunBiking.com. Include a brief caption (for each), of who is in the photo (if you know? ), and where the picture was taken. Photo(s) should be a minimum of 1,000 pixels wide or larger to be considered. If we do use your photo, you will receive photo credit and acknowledgment on Facebook and Instagram. As we continues to encourage more people to bike, please view our Destination section. Here, you will find your next bike adventure. Also, check out the MN Bike Guide! It is now mobile friendly, as we enter into our 8th year of producing the guide. So bookmark HaveFunBiking.com because you will find your next adventure. And don’t forget to smile, while you are riding and having fun. We may capture you in one of our next photos that we post daily. This entry was posted in News and tagged #biketourism, #nextadventure, bike, bike tourism, cycling, HaveFunBiking, Minnesota Bike Guide, National Bike Tourism Conference, San Diego CA, St Pete Beach FL on October 24, 2016 by Russ Lowthian.